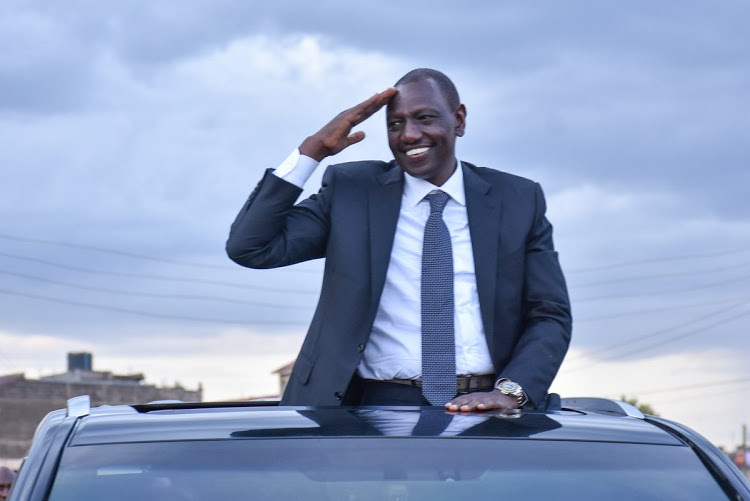 Wednesday April 17, 2019-Deputy President William Ruto has shocked many Kenyans when he revealed what he wanted to become when he was growing up in Sugoi, Uasin Gishu County. Back to his youthful days, Dr Ruto recalled on Monday, he only imagined of being a train driver, owing to the fact that he used to sell chickens near a railway line. “I never imagined I will be someone in life. The only thing I aspired was to be a train driver. I used to sell hens near a railway line so that's the best I wanted to be. I always thought that one day I'd drive the locomotive," Ruto said. The former University of Nairobi Christian Union leader has often recalled his humble beginnings, revealing a fortnight ago in Dagoretti South that he used to pay Sh1,750 for rent. "When I recall my life here, I just think everything is possible. I used to pay Sh1,750 for rent. It's in that room just across that I courted my wife and we married. Our first child was born here," Ruto said. But after going through the challenges, Dr Ruto who had completed a course in Botany and Zoology, was recruited to the then powerful KANU youth wing YK92 where he spearheaded re-election of President Daniel Moi. In 1997, Ruto joined active politics, managing to beat seasoned politician Reuben Chesire in Eldoret North. He held the seat until 2013 polls when he ascended as Deputy President of Kenya. He is planning to contest for the presidency in 2022 once President Uhuru Kenyatta retires.